Not necessarily one of change-ups considering that’s a pitch he is just now learning in his final year of eligibility. However, imagine the change endured by a young pitcher who taught himself much of the craft, who moved from Italy to Odessa to play baseball in the United States, and who pitched in pivotal games during one the most historic college baseball program’s latest postseason run. Now imagine after all that, making drastic changes to what was previously a successful process two days before the beginning of the season. 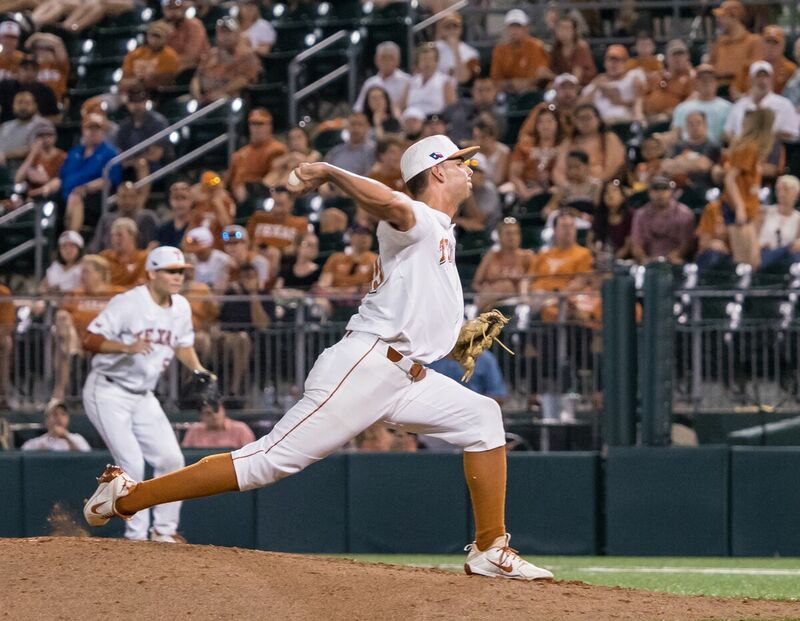 That’s what happened to Bocchi prior to Texas’ 2019 opener against Louisiana when the Texas coaches recommended he become a sidearm pitcher. Bocchi made 21 appearances as a first-year junior in 2018. He had a fairly conventional motion and though effective, he shared traits with pitchers Texas head coach David Pierce described as stock. For Pierce, stock usually means a conventional fastball in the low 90s with workable but not impressive secondary pitches. Nothing spectacular, but possibly solid. Pierce and the staff wanted more. The first time Bocchi learned how to pitch it was reportedly via instructions on the internet. In 2019, he had hands-on training from professional coaches that he said made the process of changing his arm slot much easier. Bocchi said he pitched sidearm in junior college at Odessa. The 2019 alteration was a return to something he had utilized in the past. However, he had never used his sidearm motion while on the mound at Texas. “It just took me a little bit of practice and success on the mound,” Bocchi said. Batters are hitting just below .200 against Bocchi in 2019 and Bocchi’s WHIP is an impressive 1.07. He has surrendered one extra-base hit in 19.2 innings this season and has struck out twice as many batters as he has walked. His April 9 performance against Rice was his best all season in a Longhorn win. He lasted three innings, struck out three, and hit a batter for his only blemish in his winning effort. Now, Bocchi has all the trademarks of a sidearm pitcher; his back foot is on the third base side of the rubber, he pairs his fastball with a running slider away from right-handed hitters, and he’s added another pitch that can help him pitch effectively against all opponents. “Now I’m adding a change-up, and that’s helping against left-handers,” Bocchi said. It may not have been the method he expected to use in his senior season, but it’s working for both his benefit and the benefit of the Longhorns.